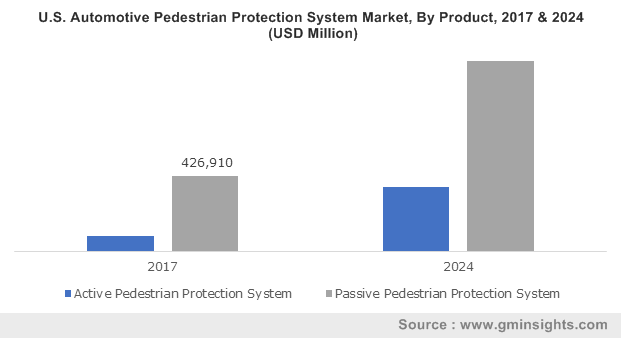 Automotive Pedestrian Protection System Market size was worth around USD 1.5 Billion in 2017 and will witness over 10.5% CAGR up to 2024. Increasing number of vehicles has in turn led to increase in the accidental collisions between vehicles and pedestrians. Requirement to ensure the safety of the vehicles and the human lives are expected to be among the prominent factors fuelling the automotive pedestrian protection system market share over the forecast timeframe. According to the European Commission report in 2015, 5,435 pedestrians were killed in road accidents in Europe. Around 45% of these fatalities in Europe occurred owing to bad lighting conditions and 37% fatalities were witnessed in daytime. During the accidents, pedestrian initiates an action too early or lack the correct way of acting. Moreover, car driver cannot contribute to accident prevention most of the times, owing to very small reaction time required to anticipate the upcoming obstacles. This necessitates the driver assistance systems to mitigate the occurrence of fatal accidents and is expected to be among the prominent factors fuelling the industry growth. Manufacturing of the automotive pedestrian protection system requires integration of components that include cameras, sensors, radars, screen display, airbags, and vehicle mounts. The cameras & radars are fitted in the side & front of vehicles, windshields, and bumpers to enable ease of object detection. Electronic control unit and sensors are fitted in the front part of the vehicle that triggers actuators that can lift the engine hood in milli-seconds. This provide safe buffer for the person’s head in mitigating the impact of collision, thereby fuelling the requirement of deploying these systems in vehicles. Several car assessment programs such as Australasian NCAP, C-NCAP, JNCAP, KNCAP, Latin NCAP, ASEAN NCAP, Euro NCAP and Canadian NCAP are developed to ensure vehicle safety. High safety ratings by these associations aids the OEMs in gaining higher consumer inclination towards their vehicles. Models integrated with obstacle detection and emergency braking systems help the OEMs secure high safety ratings, in turn positively influencing the consumer motivation. This will present favourable growth landscape for the automotive pedestrian protection technology market share. Availability of these systems as an optional feature contributes a significant increase in the overall cost of the vehicles. This is expected to be among the major obstacles for business expansion of these systems. Moreover, external airbags once inflated in the occurrence of an accident cannot be used again. Redeployment of these external airbags at the front requires substantial efforts and cost. For instance, airbag deployment system replacement cost was about USD 3000 in Volvo V40, which was introduced in 2013. Moreover, these systems are not highly reliable and have witnessed several failures over the past few years. These factors are expected to present considerable growth challenge to the automotive pedestrian protection systems through the forecast years. Active pedestrian protection system market volume will witness 18% CAGR from 2018 to 2024. The segment growth can be primarily attributed to the improvements in obstacle detection, driver warning & information conveyance, collision avoidance and integration of detection technologies with steering control. Information provided by these devices helps in mitigating dangerous situations ahead of time through warning and emergency braking. Moreover, the challenges faced in designing external passive systems for large commercial vehicles are expected to drive the demands for active detection technologies. Passive pedestrian protection system accounted for the largest market share by volume in 2017. These systems include external airbags and pop-up bonnets that are activated in the event of a frontal collision. Passive protection systems involve the expansion of vehicle structures including bonnet and bumper during collision to minimise the impact on stroller’s leg or head hitting the vehicle and thereby aids in reduction of injuries occurred in such incidences. Passenger cars automotive pedestrian protection system market segment accounted for over 90% industry revenue share in 2017. Increasing global motorization rates, spending in automotive sector, and inclination of consumers towards advanced safety systems are expected to present strong growth prospects for the segment growth. Moreover, high penetration of passive systems in passenger vehicles also contributed to the substantial industry share. Electric & hybrid vehicles segment is expected to witness substantial growth over the forecast period. This can be attributed to the growing requirement for reducing the automotive emissions, improving vehicle performance, and overall vehicle safety. For instance, Tesla built its Model 3 in July 2017, with a pedestrian protection system to reduce head injuries to pedestrians and cyclist in a frontal collision. This was achieved by deploying 19 sensors to collect information and a supercomputer to analyse this information for avoiding collisions. OEM dominated the overall volume share of the automotive pedestrian protection system market in 2017. Growth in automotive production along with the requirement of capacity utilization for maximum gains will fuel the industry growth. Furthermore, the vehicle manufactures are securing product patents in advanced safety assistance technologies. For instance, Volvo registered a patent for external airbag in 2012. Mercedes-Benz filled a patent application for pedestrian protection system with airbags on the A-pillar in 2015. In 2017, General Motors received patent for external airbags to reduce the impact of collision on the victim. This trend is expected to foster strong growth platforms for the OEMs through the forecast timeframe. Europe dominated the overall automotive pedestrian market share contributing to around 45% of the overall industry volume share in 2017. High regional penetration can be attributed to the high consumer inclination towards vehicles offering high safety levels. Moreover, major automotive industry participants that have established strong industrial presence such as Robert Bosch, Continental, Volkswagen, Daimler, have made several technological advancements in the industry space. These factors are expected to provide strong growth prospects through the forecast period. 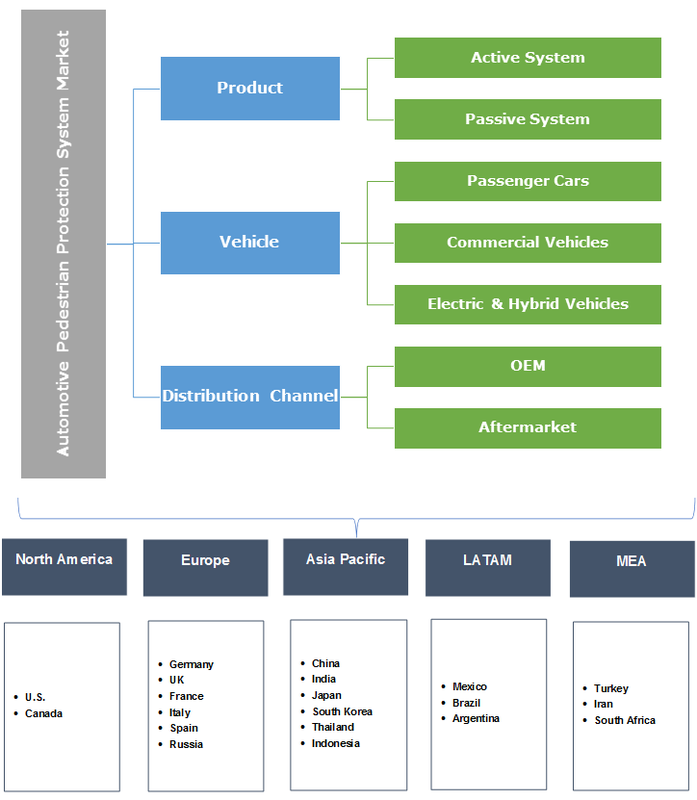 Some of the major automotive pedestrian protection system market participants include Audi AG, Autoliv Inc., Continental AG, Daimler AG, Denso Corporation, General Motors, Magneti Marelli SpA., Mobileye N.V., Nissan Motor Corporation, Robert Bosch GmbH, Subaru Corporation, Toyota Motor Corporation, Valeo, Volvo Car Corporation and ZF Friedrichshafen AG. Manufacturers are strongly focussing on the deployment of detection system in the cars for reducing the pedestrian accidents and ensure the user and car safety. Moreover, introduction of advanced product lines with better performance parameters is expected to be among the major trends expected to gain traction through the forecast period. For instance, in 2013, Volvo introduced Volvo V40 model with an external airbag to enhance the human life safety in the event of frontal collision. Industry participants have made significant efforts to make advancements in radar and sensor detection capabilities to assist the driver in mitigating the collision. For instance, in 2015, Bosch developed pedestrian protection system to assist the drivers in avoiding collision with pedestrians by enabling them to brake and take an evasive action. In 2017, Ford announced integration of pedestrian detection system in 2017 Ford Fiesta and 2018 Ford Mustang models. It will use a camera to spot people walking on road and a radar mounted in the bumper. Introduction of advanced technologies for enhanced safety is expected to be among the major industry trends expected to gain traction over the coming years.